Dubai: UAE boat manufacturer Al Marakeb is sailing against the tide as the industry sees slow growth despite marina developments and government incentives aimed at keeping the industry afloat. Since 2008, there has been a boost for the services industry as cautious owners keep hold of their existing boats, Erwin Bamps, Gulf Craft CEO said. Despite the economic challenges facing the industry, recreational powerboat manufacturer and relatively new player Al Marakeb has experienced strong growth in recent years. Established in 2007, the Sharjah-based boat manufacturer began as a custom-only builder, Nour Al Sayyed, Head of Design and Production said. “It’s what gave us our first edge in the market,” Al Sayyed said. But it wasn’t all smooth sailing. Despite acquiring a few customised boat jobs the first year was slow, Al Sayyed admits. The 2008 financial crisis hit Al Marakeb in their second year of operations. “People were reluctant to invest in luxury products,” she said. But Al Marakeb were not the only company hit by the company. Industry leader Gulf Craft saw a 30 per cent decline in sales after the downturn, Bamps said. It had its challenges as a young business competing against brands that have been established long before we have, Al Sayyed said. But the biggest challenge for the company was the learning curve. Al Sayyed and Founder and Managing Director Basel Shuhaiber were fresh out of university. In 2011 Al Marakeb switched from custom builds to standard manufacture. “It wasn’t feasible to keep the company open on just custom jobs,” Al Sayyed said. Al Marakeb sold more boats in 2011 than it did in the previous four years. Through 2012, the boat manufacturer saw further growth as sales increased by 75 per cent year-on-year. Up until mid August 2013 the company has sold as many boats as it did in the previous year. “Initially our target was to increase sales by 20 per cent but now we’re expecting to exceed that,” Al Sayyed said. Al Marakeb has also stepped outside of the UAE with 40 per cent of sales attributed to international buyers. Government-led initiatives and marina developments have boosted growth across the industry. The governments support of the fishing industry by providing incentives has lead to an increase in sales, Al Sayyed said. 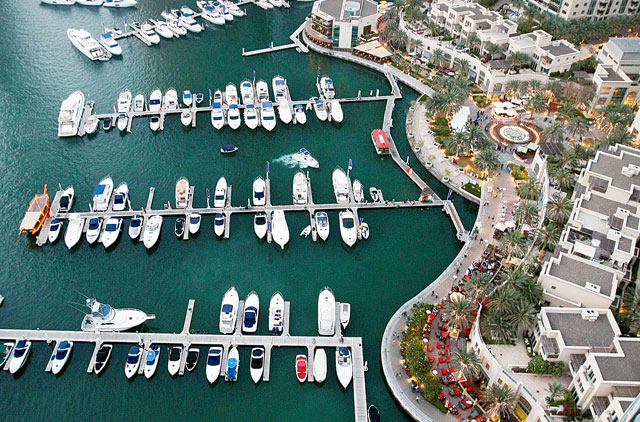 Yousuf Bin Lahej, Marina Manager at Dubai International Marine Club, said in an email the marina was at 100 per cent occupancy. Lahej believes this is indicates a good market for boat sales in the UAE. Other industry leaders believe the services industry has been boosted by boat owners who choose to hang onto their boats instead of upgrading. Bamps said the services industry is more integrated with new boat sales in the post-financial crisis market because “boat owners today are more educated”. Bamps said there were several ways to look at industry performance. “While there was a drop in sales in 2009/10 there has been continued growth since the beginning of 2011,” he said. Bamps said in 2007 Gulf Craft were involved in a KPMG study found there were 270+ registered boat manufacturers in the UAE. “You would struggle to find that many in the GCC today,” he said. Bamps said Gulf Craft was witnessing moderate growth among its recreational boat sales however overall its sales were dominated by luxury yachts. Luxury yacht sales have seen little decline since the financial crisis while smaller recreational boats make up the lions share of the market. UAE-based World Professional Powerboating Association (WPPA) Secretary General Sid Bensalah said it was an issue of branding and profile for the industry. “The image of powerboating is that it is only for rich people,” he said. Bensalah said the connection of Emiratis to the sea through fishing and pearl diving meant the ocean had an important role in the UAE. The WPPA was established in 2006 and follows a history of investment in watersports by the Dubai government over the past 20 years, Bensalah said. Bensalah said that professional powerboating and recreational boating were intertwined with each other. “When you have boats and marinas you need services and maintenance. But to convince investors to put money into these sectors you need a water event that can show the potential,” he said. The WPPA is undertaking a new 20-year strategy to revitalise the powerboating industry. Bamps said the financial crisis “completely changed” the market. Through 2010-11, the pre-owned market witnessed a resurgence as purchasers look to get more value for their money, Bamps said. Despite the challenges, Al Marakeb was confident of the strong brand they have developed locally and abroad. In 2015 Al Marakeb will move from its current 900-square metre facility warehouse to a new specially designed 1, 920 square metres. Al Sayyed is optimistic of the markets performance despite caution among other industry players. “I believe things will pick up again in the UAE and GCC,” she said.